Once upon a time I went to see a show, and it was called Barrel of Monkeys. All their shows were written by big kids and little kids. They all come from a school. The actors in it are not kids; they are grownups, and they act the plays out. There are lots of parts and lots of scenes. And now I can talk about some of the ones I wanted to talk about. “Kool-Yummm” was good, but it wasn’t that exciting. It wasn’t my favorite. The kids just kind of got hot and that’s all. And then they sang a song. The only words in the song were Kool-Yummm, Kool-Yummm, Kool-Yummm. “The Lady Who Loved the Library” was kind of a song—but dramatic and funny. There were like these police people who like to shut down libraries and keep them closed forever. And then she saved the library. It was funny because this guy named Tai was dressed up and he had a fake moustache on—and it was really kind of funny. “Graffiti Argument” was about this little girl and she wished there was less graffiti in her life. Graffiti is like writing on things that shouldn’t be writed on. There was like a picture of a son and a mother and the kids in the class kept writing the names of their crews on the picture. That was very much trouble for the guy who painted the school. If you don’t know what graffiti is you can learn it from me--Ada Grey! “Magical Place” was about this little girl played by Dixie who had these mean brothers. She went to a place and it was called a magical place. And these little elves stood right outside and they sang right outside of Magical Place. And she said I want to stay here forever. And then they sang, “Magical Place, stay here forever; Magical Place, stay here forever; Magical Place, stay here forever; Magical Place, stay here forever.” And then she decided it wasn’t a magical place—it was a yelling place. She decided to live with her brothers. They said sorry but they didn’t really mean it. It was one of my favorites. We sing “Magical Place, stay here forever” at our house all week. “Destroyer” was very scary. Destroyer was really destroying everybody in the world by putting his fingers out. He had a skull head, so I couldn’t tell which one he was. But I think I know it was the guy who played Eddie. Emjoy was one of the girls that got destroyed. She fell down. “Beats” was all about beats of course—like a stomp or like clapping. It was like beats, boots, gym shoes. Clap clap clap. It was fun. Sarah was really good at that part. The show is like Laugh Out Loud. That is a place where one of my friends Lillie works. She is the owner. Both the companies are funny. They get costumes and use the props that are already out to set the scene. The acting was awesome and funny—in a good way. My mom calls me a kookamunga, so I think I would be good to be in Barrel of Monkeys--because they are funny! I want to be in Barrel of Monkeys when I am older and write a story for it. And it would be called “Superheroes Do Not Save Villains.” It would be about a superhero who liked to save villains, but the other superheroes thought that she was crazy. And then at the end she realizes she would like to save the world and not just villains. I think all ages would like this play. You could just cover the little kids’ eyes at “Destroyer.” Grownups would like the play because grownups like funny. I think people would like it because it is very good and the acting is good and everything about it is thrilling. I think Barrel of Monkeys want to make everybody happy who comes to see the show. I think they think the kids who write the stories are smart and cool. Once upon a time I saw a movie called A Night at the Opera. It’s a Marx Brothers movie. It is really funny. Three year olds or four year olds or two year olds would like it. I think everybody would like it because it is super super super super super super super hilarious. It is about an opera. Like I said in the beginning it is called A Night at the Opera, so it is about an opera. There’s a guy and he likes a girl but she doesn’t like him. And she likes a different boy and he likes the girl. They sing at the opera. That is what he really means because all these people on the ship are in his room. Harpo—he can’t talk. He honks a horn. He has curly hair and he just does what he wants and not even asks. Because he can’t talk. So he is kind of rude but kind of funny. 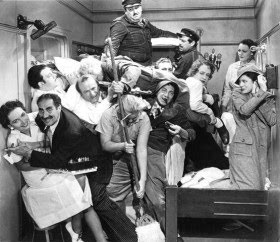 In the middle, Groucho keeps saying “The party of the first part” and Chico says, “No, I don’t like that.” And then he keeps going over and over again like, “The party of the second part…” “No, I don’t like that.” The party of the eleventh part…” “No, I’m going to think about it.” They are tearing the contract apart. Margaret Dumont--she had a very high voice. I wish that I was her because then I would get to be with the Marx Brothers. Because she is really famous—that’s why she is in the Marx Brothers movies. She doesn’t get treated very well—but it was kind of funny. I think I would really rather play Chico because he is just so funny. There was a scene and a policeman was chasing them around. The beds kept going everywhere. And at the end of the scene they dressed up like an old man and an old woman and Chico was just like a chair. The music was great and funny. Harpo plays harp. Chico plays piano. They are funny musicians. In another movie—Animal Crackers—Chico plays a song and it has lots of dings, and it goes across dings, and it is really hilarious. At the end, two people were singing at the opera. They were super excited because they had to sing. The Marx Brothers are about to go to jail, but then the policemen decided they won’t go to jail. Harpo was pulling these ropes and it kept changing the scene. And the background went up and down and up and down. And then when this old lady turned around, he wasn’t there--he was behind the scene! That was a really funny scene. People should watch this movie because it is super fun to watch. 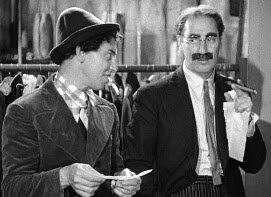 I think everyone would like the Marx Brothers because they are funny and kind of smart and tricky. They say funny things and do funny things like pull down curtains and ask for hard-boiled eggs in a funny way. This is Ada Grey, and I hope that you enjoy my reviews. See you some other time. Good-bye! 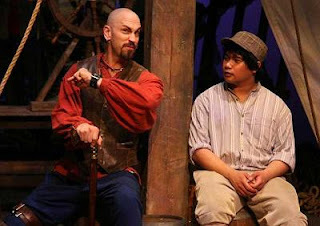 Once upon a time I went to a show and it was called The Ghosts of Treasure Island. Sometimes it was funny; sometimes it was sad; sometimes it was scary. Sometimes I wished I wasn’t there because it was so scary, but now I wish I was there right now. And there were some very funny parts. Like when Squire Trelawney said, “we will go there poor and we will come back RICH!” Which kind of gave the treasure away. I thought that was very funny. He didn’t say it high he said it low. And how Captain Silver was yelling and then he just talked light—he talked very light then and when he was mad he talked very LOUD. I thought he could talk as loud as a screaming rat—a screaming rat because he was a villain. But the guy who played him—JAZ—was not really a bad guy. A screaming mouse would mean if someone was screaming loud but he or she was really a good person. Mice don’t bite you, but rats do bite you—and it could really hurt. The girl pirate who was on the crew—arrgh mateys—yes-a-mateys—she was really cool. I thought that this character could do really good karate moves if she wanted to. I thought she looked tough. She has a really fancy dress. There was some pirates and they were in a band. And I thought that their music was really good. Misha composed very good music. Does anyone know Misha? If you do, you can go see him at Strawdog. And they taught us a song: it was called “Yo Ho Ho and a Bottle of Rum.” Rum is a kind of drink—I’m sure that everyone in the play knew that. Did you know that? If not, you can learn it from me—Ada Grey! I think it tastes bad because pirates like things that are bad. There was a character in the play and he was called Ben Gunn. I have no idea why he was called Gunn, but I think I would guess and my guess is that it was because he was once a pirate and pirates have scary names. He had a very strange costume, but it wasn’t too strange. It was all torn because he’s lived there so long. Jim was a little boy. He was older than me but a kid. I thought the guy who played Jim Hawkins was a great guy. He’s a good actor. I liked how dramatic everything he did was. There were lots of pirates. Most of them were mean. Lots of the sailors were smart. 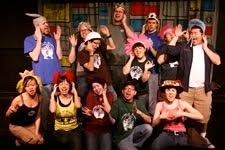 Everyone in the play was smart—I just thought they looked smart. They did smart acting: they did lots of practicing. The fights were very scary and fun. I thought they moved very athletic. Does anyone know what athletic means? If not, you can learn it from me—Ada Grey! I thought that someone who delivers people to their graves should just carry the characters who died offstage instead of the dead people walking off because it felt like that gravedigger would never come if you didn’t see it. The accents were very cool. I thought that they sounded very British. I thought that they were very cool as well when they talked. The director I have met before. She is a very nice lady. I thought the direction was great. How she did the play was all in a straight line and not at all circled. (A circled play means nobody understood it.) She made everyone understand it. I think everyone would like this play. But I think that people who are not very attached to plays shouldn’t go. But if you are attached to plays you should go. If you listen to plays but do not look at them, that would be fine. And if you just look at plays and do not listen to them, that would be fine too. You’ll understand it anyway. The end. See you some other time! You can see more of my blogs. See you soon! Bye! 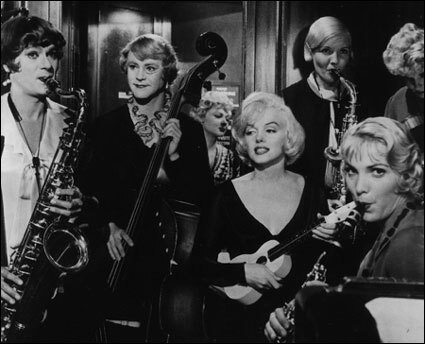 Once upon a time at my house I got to watch Some Like It Hot. If kids that are three really want to see it, tell them there is some shooting. And people do get killed. But not very many. All of the people who are killed are not nice, very mean and rude, and not athletic. Athletic means that people are very acrobatic. The boys are athletic because they can run on high heels—that’s pretty athletic. And there is a character named Sugar Kane. Marilyn Monroe plays Sugar Kane. I think she is kind of hilarious. She waves her hand—I think it is funny because she says “just relax” to Junior who is really Joseph. I think she is a little bit athletic but not very athletic because she can run in high heels as well. Oh the dresses—they were very beautiful. They make her look very fancy. Some of the music was very slow and some was very fast. Like the walking—it was fast and slow. Sometimes it was slow—but when the bad guys were there then, no, it was not slow. In the end they are going to hear some more about the bad guys. The title comes from Joseph/Josephine/Junior who says “Some Like it Hot.” He’s talking about jazz. I adore jazz music. I prefer hot. He likes classical, but I like hot because I like dancing. Cha cha cha. The maraca scene was really funny because he was like cha cha cha. The guy who owned the yacht proposed to the other man—Jerry/Daphne. In one of the scenes there were roses--they keep getting passed from person to person from mouth to mouth. That means I should say now they did roses and roses and roses of them. Daphne and the man who owns the yacht are in it. They keep switching scenes between the yacht really (the kissing of Sugar and Josephine/Junior/and Joseph) and the dancing. They were in a boat at the end and the bad guys were chasing them. And Sugar Kane was trying to catch up. Then this man who is actually in love with another man (at this time guys couldn’t marry guys) he says “nobody’s perfect.” That means no one is the goodest person in the whole world to marry. I think since she had the maracas and she looked excited then, that Daphne wanted to marry him. But I think in real life Jerry/Daphne had to marry one of the girls in the band. Because of the time that it is he had to marry one of the girls in the band. Or he might not even get married at all. It’s his choice so I guess he might marry the guy or he might not if it was in real life and they were still alive. Tell your kids it is in black and white. People who would like this would be people who like fighting, people who are athletic, and people who are funny. But just any person would like it—these are just my guesses.